This November, Uncubed brought 80+ startups and hundreds of job seekers together in New York for a new kind of career fair based on what we’ve come to associate with startup culture: chutzpah, high energy, and foosball. Before Pesh Kanthan headed over to staff his company’s booth at the recruitment portion of the event, he had some of his own recruiting to do. His fellow co-workers at Mediamorph were deep into another day of work, but Kanthan wanted to wrangle them away from their desks to come to Uncubed and help the company find new talent. Like most of the companies recruiting at Uncubed, Mediamorph is growing fast. They recently received $10M in Series B funding and have a lot of new positions to fill. So many that Kanthan, their VP of Data Sciences and one of their original three employees, spent the day shaking hands with potential hires. He hoped the one-on-one connections they’d be making with hundreds of job seekers would speed up their hiring process. The company is looking to fill around eight immediate positions in development and technical product management, and in the coming months will hire “a good number of junior developers” and a mix of roles in management and strategy. Some weeks before, Mediamorph attended another tech recruiting event that yielded ten interviews and four job offers. 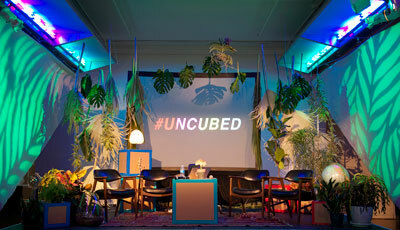 By comparison, he hoped that the high caliber of attendees at Uncubed would result in even more prospects. Attendees were equally enthusiastic. Arnab Mukherjee and Dhananjay Bapat, both MBA students at Cornell, came to NYC specifically to attend Uncubed. Armed with resumes in hand, they and at least four other Ithaca-based students made the long drive so they could jumpstart their job search before graduation. “I was a little worried because I’m still in school and I’m looking for a non-technical job. But I was just talking to a recruiter who was also non-technical and she told us ‘Don’t worry, if we can’t hire you now we may be interested in the future,’” said Mukherjee. In many ways, these students came here for an education. Bapat even sat in on a faux class, with desks in rows, as part of a demo given by Amplify, an education startup. “It’s been worth it just to learn about all these companies up close. I already found some I really like,” said Bapat. Plenty of tech students attended as well, including Cara Rano and Hayley Anderson, currently enrolled in Metis intensive courses in UX Design, and Ruby on Rails, respectively. Experienced developers were also in attendance. Kevin Ruddy, a back-end developer currently employed at an education company, has a good idea of what he wants—and doesn’t want—in a new job. Norah Hannel, a technical sourcing analyst for AppNexus, had been collecting resumes all day. She and four other recruiters spoke with hundreds of attendees about the 130 positions the company is looking to fill. Her colleague, Aaron Rosen, has been at Uncubed a couple years in a row. His wasn’t the only company at Uncubed that has grown over the years to have hundreds of employees. Kanthan of Mediamorph has been around long enough to remember when recruiting wasn’t as easy, or as fun. “Silicon Alley has really come a long way,” said Kanthan. He described a recruiting event put on by a trade group back in 2009. “It was held in a basement. Everyone was ‘hiring,’ but no one had any money. Now look around,” he said and gestured across the room. 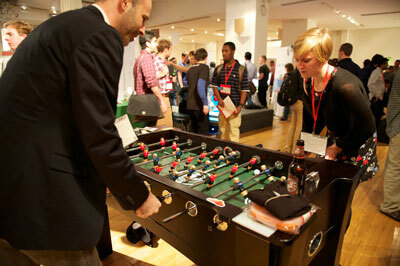 The floor was buzzing with energy and a raucous game of beer pong was in full swing. Image credit: Photos courtesy of Uncubed.